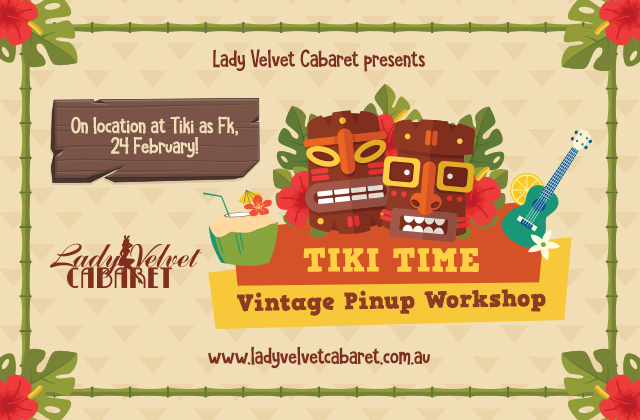 Get ready for a fantastic ON LOCATION Vintage Pinup Workshop with a Tiki Twist! Join legendary pinup and performer Sugar du Joure and the incredible Claire Alexander, Photographer, for a one-day workshop at our favourite retro-kitsch haunt, Tiki as Fk. The workshop will include hair, make up and styling tips from Sugar du Joure as you learn new and exciting tricks to achieve your perfect pinup look. Sugar will also guide you as you pose for the camera in and around the beautiful Tiki as Fk venue – with plenty of unique opportunities for shots (and selfies!) at the inside bar, rooftop bar, and sunken sixties lounge. For the first time, your workshop fees also include your first two photos from Claire Alexander, Photographer, with the option to purchase extras after the shoot, as well as your full on-location pinup workshop! Our workshops are known for their friendly, welcoming atmosphere, and are a wonderful way to boost your confidence, learn industry tips and tricks, and meet like-minded pinup and retro enthusiasts – not to mention you can build up a high quality portfolio of shots from each of our workshops, perfect for social media, performer headshots, or submitting to publications. Enrolment costs $149 including on-location workshop and 2 edited photos!